Updated 4:50 p.m. | Posted 1:54 p.m. Forget Spider-Man. St. Paul has Spider-Raccoon. 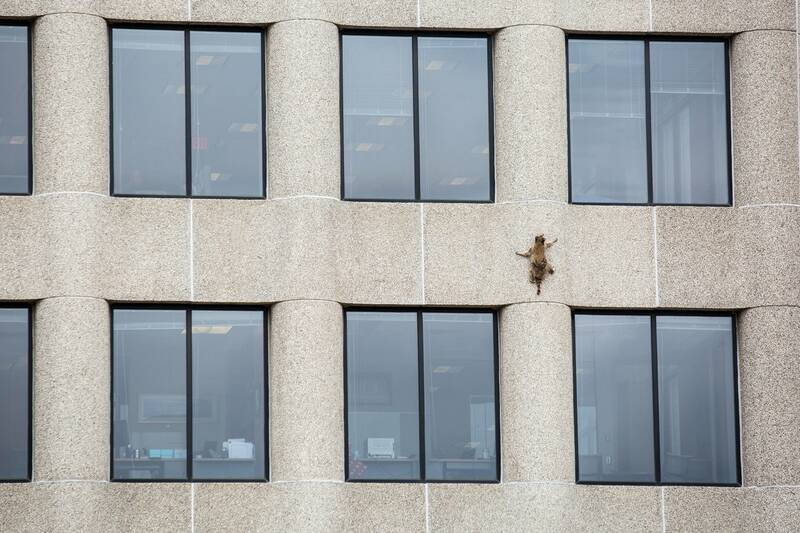 On Tuesday, a mottled brown raccoon, originally stranded on a downtown office building ledge on 7th Street, proceeded to escape to the roof of the two-story building, then climbed another 20 stories up the side of the nearby UBS tower, as people gathered on the street below. The animal remained perched on a ledge Tuesday afternoon, more than 200 feet above the ground. The raccoon had been climbing up the rough surface of the concrete pillars that run up and down the sides of the office tower. 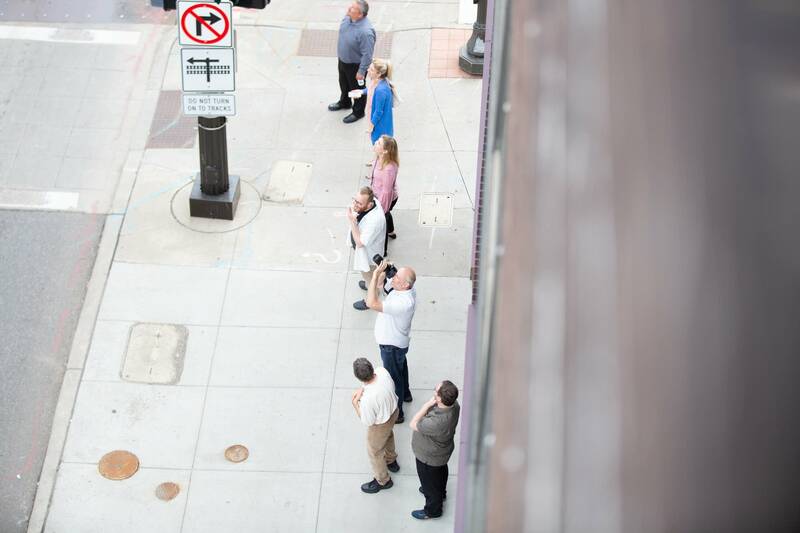 The drama began Monday when the animal appeared in a niche in the wall of the Town Square building, on an outside wall of what was once the Donaldson's department store at 7th and Cedar streets. Calls to the Wildlife Rehabilitation Center of Minnesota and the city of St. Paul's animal control pleaded for help. Instead, a trio of building maintenance personnel rigged up a 20-foot length of lumber, by screwing two-by-fours together, hoping to offer the animal an escape after it had huddled against the side of the building all day and night. The raccoon had other ideas. It scrambled away and fled along the side of the building, scaled the building at the corner of 7th and Cedar streets and then started scaling the office tower. 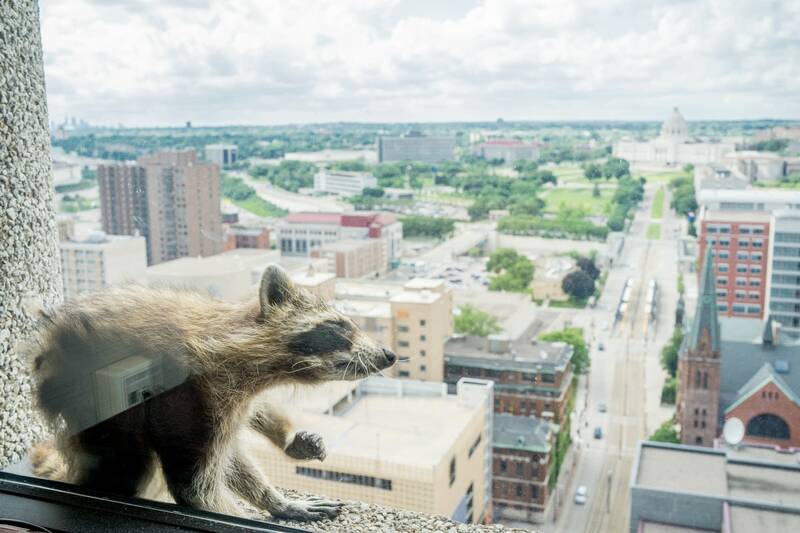 MPR News may not have been the first to see the raccoon but made a big enough deal of it online that by Tuesday afternoon #mprraccoon had become a trending hashtag on Twin Cities Twitter. The raccoon's quest became kind of a celebrity cause by late afternoon. Hollywood director James Gunn, whose movie "Guardians of the Galaxy" featured a hero raccoon, offered to donate $1,000 to charity in the name of "anyone who saves this raccoon. I can't handle this. Poor dude." 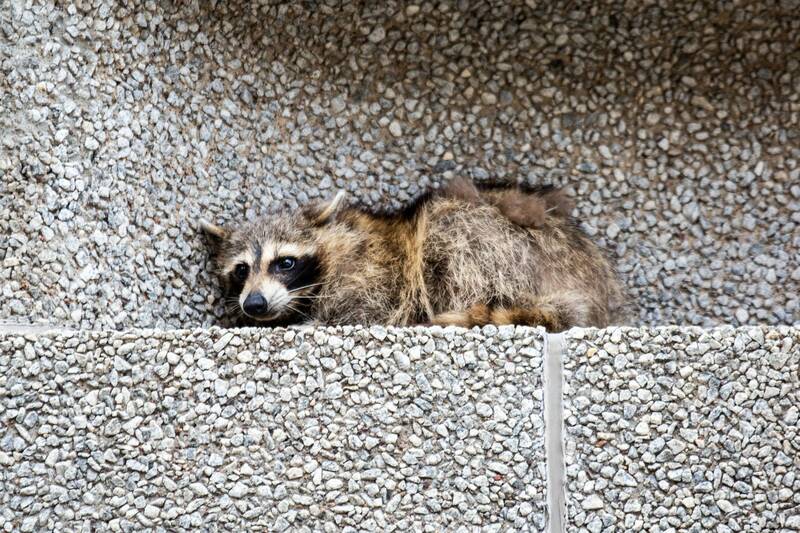 While a raccoon scaling a skyscraper is pretty much unheard of, climbing in general is a big part of the animal's survival instincts, said Bryan Lueth with the Minnesota Department of Natural Resources. "If I had to come up with a scenario, I would say it was maybe holed up in an alley and it got rousted out of there by something and then ran out onto the sidewalk, and then there's all these people around. It's like 'Ah!' The natural instinct is to climb," Lueth said. And they're equipped for the action with strong claws and feet. "Digging into tree bark is certainly a little bit easier than hard stone," Lueth noted, "but there must've been enough cracks or crevices or textures where it could get a grip." Being nocturnal, raccoons are a rarer sight during the day, but there's a big population in the Twin Cities. "They're an animal that has adapted to living in close proximity to people — taking advantage of food sources, denning locations, relative lack of predators — so they're usually pretty successful," Lueth said. While it's been fun watching this raccoon's adventure, Lueth and other experts caution that if you encounter a raccoon or any other wild creature, it's important to appreciate them from a distance and do not feed them.